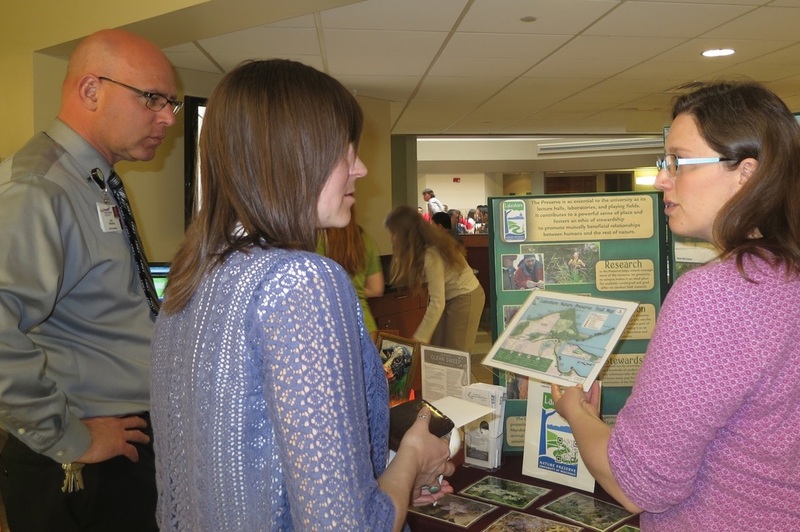 The Earth Day celebration at Eagle Heights Community Center, organized by University Housing, focused on ways to conserve resources through recycling, introduced Aldo Leopold's land ethics, and promoted the Lakeshore Preserve as a place to cherish and to learn about the land. The two Preserve exhibition tables were crowded with attentive and appreciative children and their parents. Two hours flew by in a flash for Sue Denholm and Gisela Kutzbach of the Friends and Bryn Scriver of the Preserve staff as they helped children learn about two of the multitude of processes in a natural habitat: First, the children created flowers and bees from paper and pipe cleaners to illustrate that flowers need pollinators. Second, the children learned about the food web in the Preserve woods by figuring out who eats what and creating a food chain in the shape of a mobile beginning with the sun as source of energy. They showed great skills at drawing centipedes and preferred the coyote at the top of the food chain. 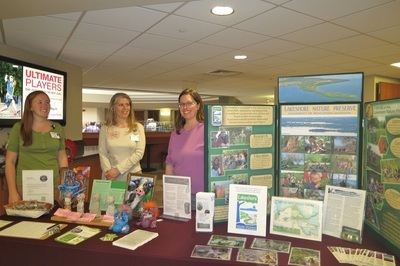 During Earth Week, Bryn Scriver of the Preserve staff and Gisela Kutzbach of the Friends exhibited over three lunch periods at the busy entrance to the UW Hospital Cafeteria – in conjunction with the Hospital Green Steps Challenge. 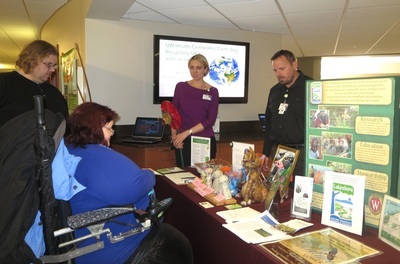 While the Green Steps program invited employees to take steps to a more sustainable workplace and home, the Lakeshore Preserve display encouraged people to step into the green of the Preserve. Of special interest was the Audio trail around the 1918 Marsh. 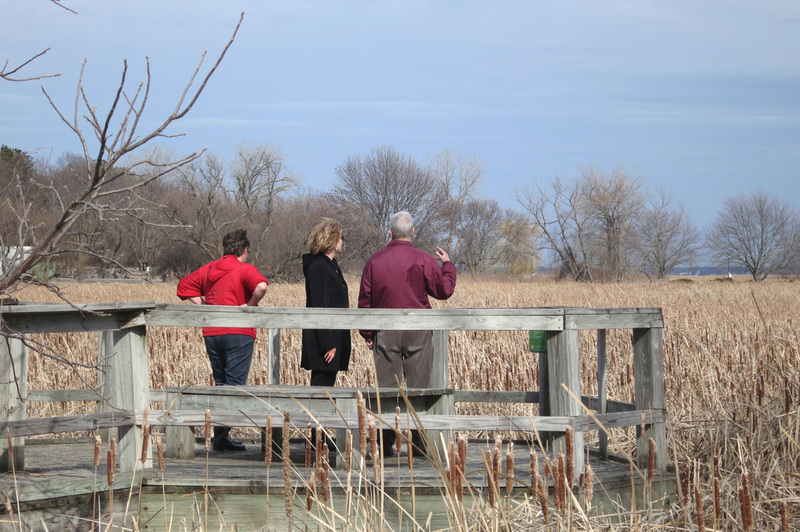 Many employees were unaware how accessible the Preserve is to them. 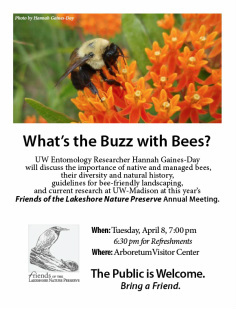 The partnership with the UW Hospital Sustainability group will continue with a volunteer day in the Preserve. 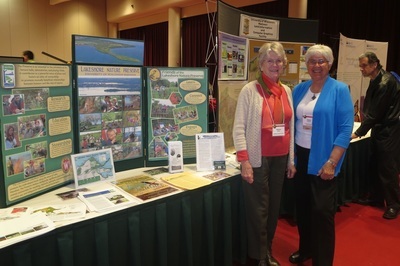 The Friends exhibited for the Preserve at the annual Nelson Institute Earth Day Conference on April 22. Gisela Kutzbach and Pat Becker were pleased with the attention our display received and were able to raise awareness of and interest in the Preserve. 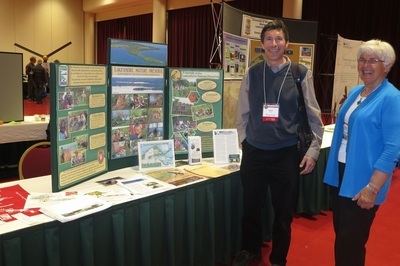 This was also a good opportunity to network with other established environmental organizations in the area. Nearly 800 participants from across Wisconsin and the upper Midwest came together in this exciting and thought-provoking day of presentations and discussions. The focus was on a new geologic epoch - the Anthropocene or "age of humans" - requiring new strategies for ecology, economy and justice in a rapidly changing world. The 2014 Annual Meeting of the Friends, held on April 8 at the Arboretum Auditorium, attracted over ninety Friends and friends of the Friends. 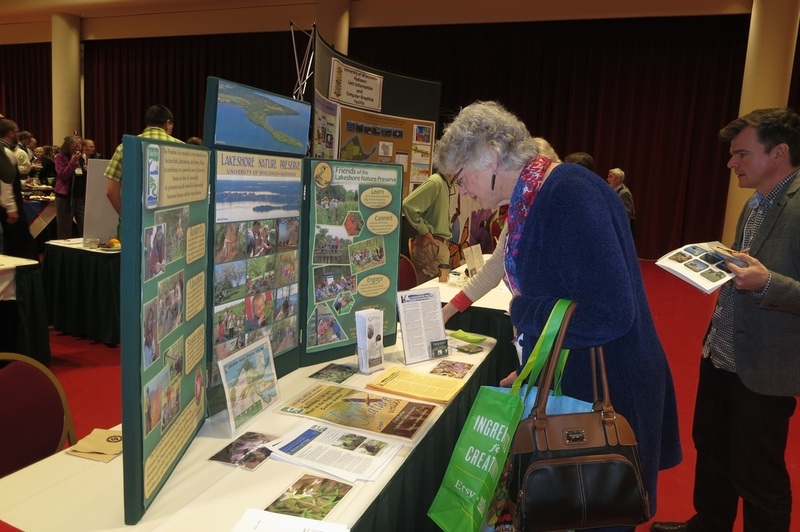 The crowd enjoyed refreshments, the exhibits, and talking with other attendees before the meeting. Retiring Board members Marcia Schmidt (treasurer for 7 years), Glenda Denniston (9 years on the Board), and Paul Borowsky (field trip coordinator) were honored. Retiring president Gisela Kutzbach was presented with a watercolor painting of the Heritage Oak. New Board members Kris Ackerbauer, Gretel Dentine, Doris Dubielzig, and Peter Fisher were elected. After the annual address by Gisela Kutzbach, focusing on the Friends work toward achieving the revised mission, Gary Brown, director of the Preserve, reported on the multi-year restoration projects beginning in the Eagle Heights Woods. 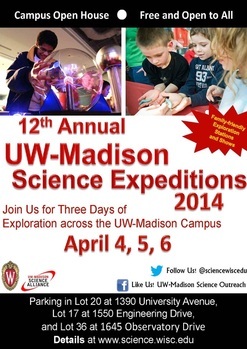 UW-Madison welcomes learners and explorers of all ages to campus to experience science as exploring the unknown at the Annual UW-Madison Science Expeditions in early April. It is a fun, family-friendly event for kids and adults. The Friends contributed for the second year a featured "Science Spectaculars" Tour of the Preserve. 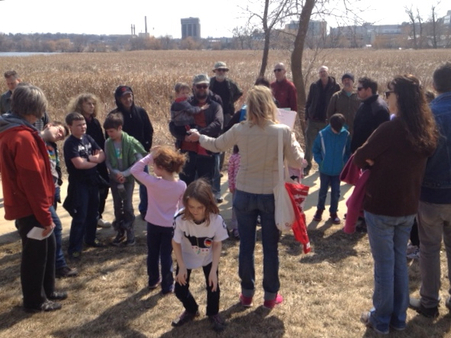 Over 35 adults and 13 children attended on this pleasant Sunday afternoon, April 6. 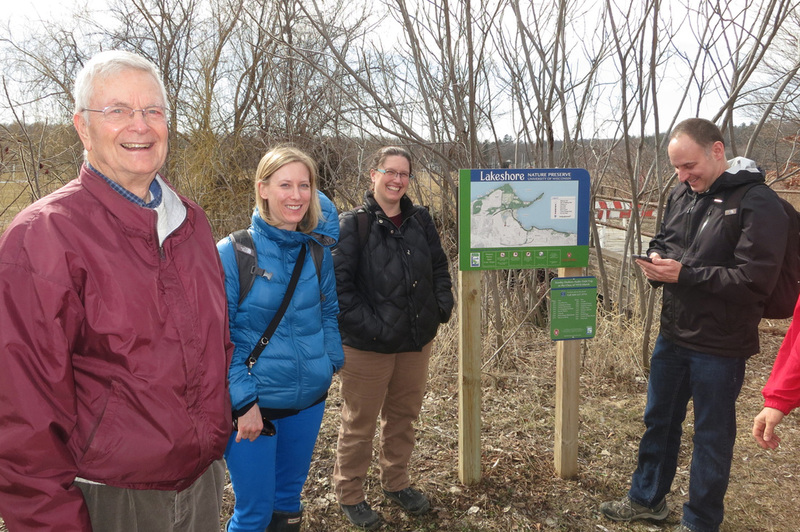 Friends member and naturalist Sue Denholm, assisted by Gisela Kutzbach, met with participants at the Picnic Point Gate. With several stops on the way, they learned about the natural history, geology, and the stories of human uses of the area, from the builders of the effigy mounds to farming in the 1930s. The children were especially intrigued by the dead tree trunk at firepit #1 which is home to many animals and living things. On balmy March 31, Shannon Bunsen and others of the UW Hospital Environmental Sustainability Committee and Health & Healing, Wellness program met for a "walkthrough" of the Dodson Audio field trip around the 1918 Marsh, with John Magnuson, Bryn Scyver of the Preserve staff and Gisela Kutzbach as guides. Information on walking routes and maps and the Audio Field Trip pocket card will be shared on the hospital's wellness blog and Green Steps page. 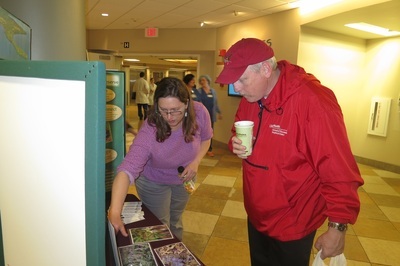 The Friends, together with the Preserve, will have an information booth at the hospital during Earth Week. A guided tour for staff is planned for May. Connecting with hospital employees to the Preserve has been a long-term goal of the Friends. 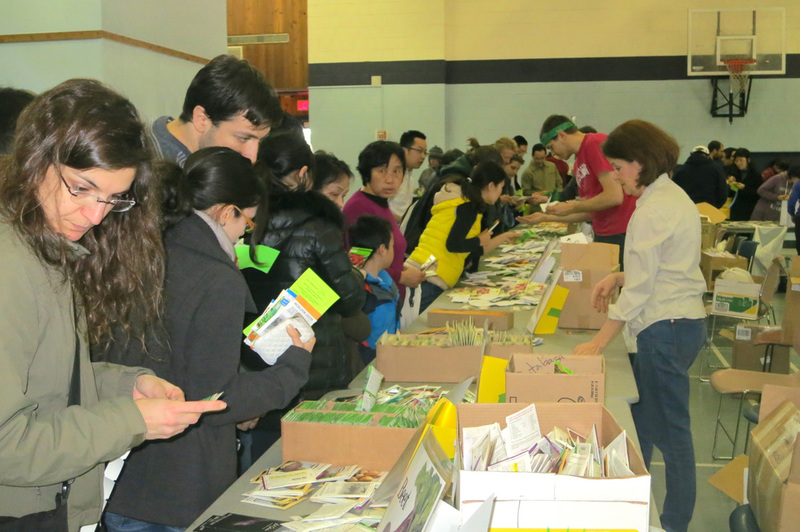 Seedfair at Eagle Heights Community Center, March 29, 2014. 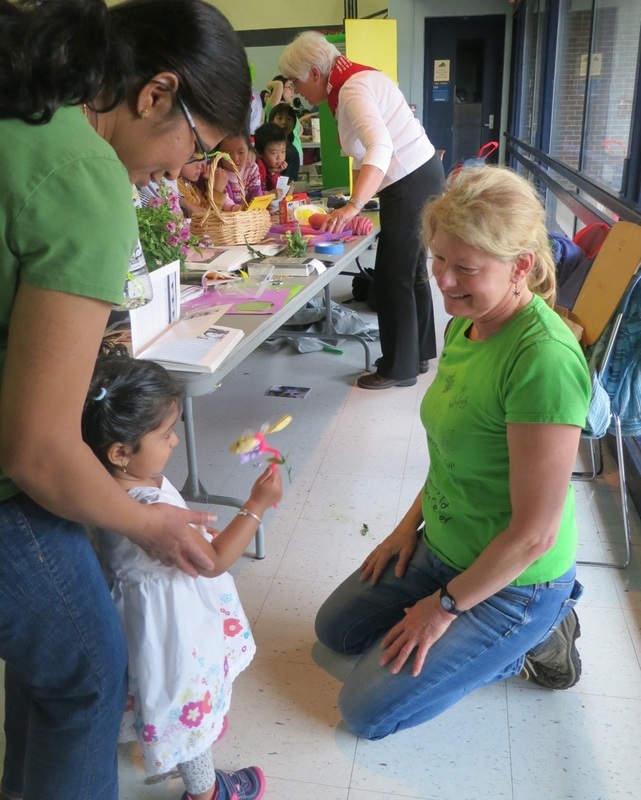 Friends naturalist and educator Sue Denholm created a soil making and seed planting assembly line that attracted droves of children and adults. She was assisted by Gisela Kutzbach in helping children mix their own soil from an astonishing variety of ingredients: compost, silt, sand, wood shavings (provided by Tad Pinkerton), small branches, dried up leaves, the exoskeletons of dragon flies that Sue had collected along a pond up north last fall, animal hair, microbes (fake) and decomposers (fake). Colorful posters and test tubes filled with samples of different types of soil helped explain the characteristics of what gardeners might call good "dirt." Children planted their bean seeds in their paper pots and wetted them in the final steps. 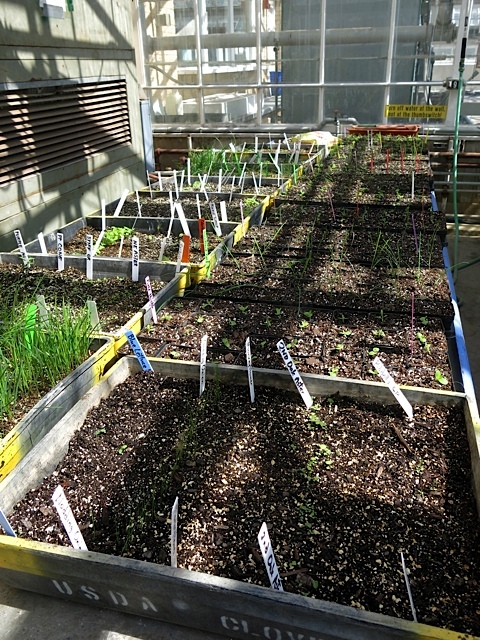 Children and parents alike were determined to care for their seedlings until transplanting them into the gardens. Gardeners received 15 tickets per plot at the entrance and then redeemed them for seed packets from the rich supply. Flower seeds were free. Many are first time gardeners, eager to try. They could take a workshop on gardening and pick up excellent instructions to make their produce grew. This well organized event attracted the residents of Eagle Heights as well as many Madison Community gardeners who are renting plots. 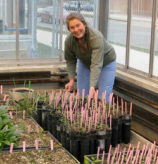 Glenda Denniston, with Mary Trewartha, Kathie Brock and others, has been working for the last few weeks planting prairie and savanna seeds, tending them as they emerged, and transplanting them to larger containers. She reports, "We moved the flats into the greenhouse (Grounds greenhouse, near Soils) a couple weeks ago and are transplanting wildly. 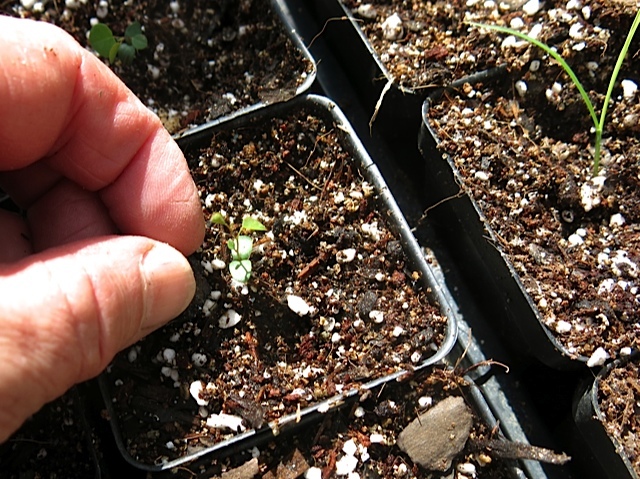 Experimentation has shown us that these plants actually do better when transplanted as TINY seedlings. I don’t know how much longer we’ll be transplanting, as we don’t know yet how much space we’ll be allowed." 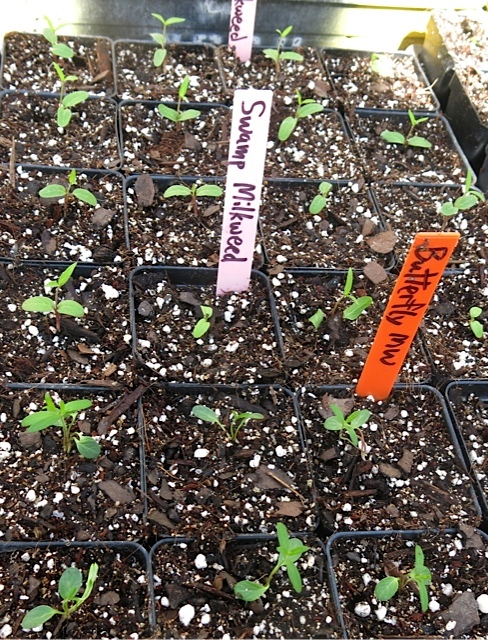 Later in spring, the thriving seedlings featured below will be planted in the Preserve. "We now have 22 flats of transplants, which means we have 704 plants so far," Glenda reported, "There will be well over 1000 when we're ready to plant - some years it's as many as 3000." John Magnuson, President of the Friends 2011-2013, and Stanley Temple, long time Friends member, have been named Fellows of the Wisconsin Academy of Sciences, Arts and Letters. Fellows of the Wisconsin Academy are elected for their high levels of accomplishment in their fields as well as a lifelong commitment to intellectual discourse and public service. John Magnuson is Professor Emeritus of Zoology and Limnology at the Center for Limnology, UW–Madison. He was the first director of the Center for Limnology (1982-2000) and taught both Limnology and Ecology of Fishes for over thirty years. The field trips he conducts for the Friends on the historic Limnos boat are legend. 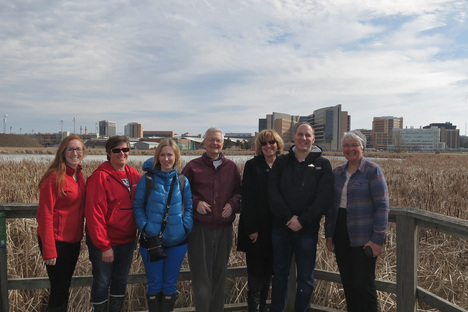 His recent study of the "Class of 1918 Marsh in winter 2012/13 - habitat for fishes, ice and snow, and road salt" documents the negative impact of the use of road salt on the water quality of the marsh and lake. Stan Temple, Professor Emeritus in Conservation and an ornithologist, held for 35 years the academic position once occupied by Aldo Leopold. He is currently Senior Fellow with the Aldo Leopold Foundation. He serves with John and other experts on the Friends ad hoc committee to evaluate the impacts that the development of the University Bay playing fields proposed by the UW Recreational Sports would have on the Class of 1918 Marsh and the Preserve. 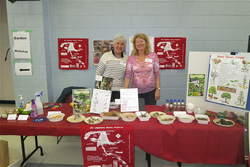 The Friends are fortunate to have these and other recognized experts in environmental studies volunteer their services.